Mix the water and milk together. Mix the salt to the flour and oatmeal in a large bowl. Dissolve the yeast with a little warm liquid and add the sugar. Allow the mixture to become frothy. Mix the dry ingredients with the yeast liquid to make a batter adding the remainder of the warm liquid. Cover the batter with a clean cloth and leave in a warm place for about an hour. Pour out enough batter on a well-greased griddle to make an oatcake of about 22cm. The surface will be covered in holes as it cooks. Flip the oatcake after 2-3 minutes when the top side has a dry appearance and the underneath is a golden brown colour and cook for another 2-3 minutes. Try to use the heaviest frying pan available as this will keep the heat constant which is best for making oatcakes. Great served with fried bacon, mushrooms and cheese as a savoury snack or with butter and jam as a sweet treat. Oatcakes can be frozen and a microwave is the ideal method of defrosting and reheating them. I heard that soldiers returning from India in days gone by tried to duplicate the chapattis they had enjoyed but using local ingredients and the North Staffordshire Oatcake was born. The exact recipe varies between oatcake shops and was for many years a closely guarded secret. There would be an oatcake shop on nearly every street corner years ago. Not just selling the oatcakes but also hot filled oatcakes. This was fast food prior to the Golden Arches and supersize me. Being very much a regional dish – indeed, less than a county – oatcakes were always missed by ex-pats from the Potteries. There used to be a hotel in Leamington Spa that sent someone up to Stoke-on-Trent at the crack of dawn on a Sunday morning to get supplies. Being made with oatmeal, they are actually quite high in fibre but filling with melted cheese and fried bacon may reduce the health benefits somewhat. My favourite is to place under the grill with thin slices of cheese on. When bubbling, add a generous amount of Branston pickle and roll up. Match day = oatcakes, now living in Cyprus …got to have em! Thanks for this, x love to castle. Lovely and much nicer than the one I bought in a cafe. Good way to remember relatives. Thank you for this recipe my husband grew up with these and now I’ve learnt to make them for the whole family! Simply delicious great tried and tested recipe! I’m a Yorkshire man and you can’t buy them up here. My wife’s from North Staffordshire and we have them every time we visit but it’s really good to have them when you fancy them at home. 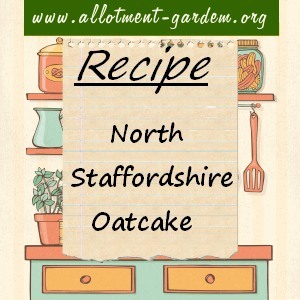 I would like to thank for the recipe for North Staffordshire Oatcakes. I come from Stoke On Trent and I love Oatcakes and when I used to visit I’d bring some back with me or when my Aunt used to visit, always bought some with her. Definitely going to give these babies a ago. My husband is a ex Stokie and he and our son are craving these gems. So am I just quietly. If they are not good I can blame the recipe. Might start a craze here in OZ. Thanks for sharing. I lived in Sheffield as a kid and we used to buy oatcakes from a guy who used to sell them in the street. He’d travel around the suburbs on his bike. Live overseas now and I’m happy I can once more fry my oatcakes in bacon fat. Yummy. I remember the oatcake shops on the street corners. Over 45 years ago I had a boyfriend who lived in Stoke on Trent and these were a proud tradition in his family when I visited. I was delighted to find them in a wonderful farm shop this weekend (Denstone Hall Farm shop and cafe, Alton) and bought a batch, treating myself to the bacon, cheese and mushroom variety for my Mothers’ Day lunch! They were amazing. I am so pleased that I have found your recipe so that I can try and make them for myself but I am sure they won’t be quite as good as the real thing! Thank you. I am from the Potteries and these were an important part of my diet growing up and I missed them when I moved down south. My mother used to bring 3 dozen down to Kent every time she came to visit and so my children grew up knowing that they are the best breakfast food ever. So pleased to have found this recipe! I was evacuated to Stoke on Trent in 1940 and lived with a fireman, his wife and daughter, in Tunstall. He used to buy these Oatcakes from a local shop and we always had them for breakfast with bacon & melted cheese (rations permitting). I haven’t tried your recipe yet, but I will as soon as time permits. I lived & worked in Stoke on Trent for 6 yrs. and although I am now 88, still try to get up there as much as I can. These are delicious, thank you for the recipe.